Ramin Bahrani adapts the Bradbury novel to address new media, and this fake quote encapsulates the central mission statement of the vague government body in the film. This is a government who tasks fire fighters with burning books instead of putting out fires, the aim being to eliminate free thought. Ideologically, the fire fighters believe that they are making the populace more happy by removing the questioning that comes with intellectual debate. The appropriation of Bradbury’s source material, which obviously was addressing a very different technological era, is at best quaint, and at worst eye-rollingly on the nose. The dystopian world is explained during a presentation for school children, who in unison chant vitriolic boos at the very sight of a book-shaped object. Captain Beatty (Michael Shannon), soon to be Major, and his fiery (pun intended, I guess) protege Guy Montag (Michael B. Jordan) discuss the danger books and those who illegally spread them pose to society. Radical free thinkers known as “Eels” commit crimes of “graffiti” by uploading works of literature to the world’s advanced internet system. It’s all just as black and white as it reads on paper. But the film takes it a step further through its depiction of society and this internet infrastructure they call “the 9.” A social media livestream follows Beatty and Montag through raids of Eel hideouts. Crowds on the street and online cheer them on as celebrities as they light up hard drives and literally erase the identities of criminals. Freedom of the press is dead and the public is a horde of mindless zombies being corn-fed propaganda. Plato’s allegory of The Cave is invoked. Blindness is the loss of free will. Yadda yadda yadda. In exercise, it all reads more Orwellian than Bradburian. The real fear on display is that of surveillance. Yuxie, a stand-in for Siri or Alexa or Google Home, watches you even when you turn her off. When Montag steals a book and is exposed to the world he is helping to destroy, he has to run away to a hidden location with a political dissident (and eventual love interest) Clarisse (Sofia Boutella). Whether the film is addressing a contemporary media landscape in which print and analog are obsolete seems less pertinent. It just reads like a 1984 re-skinned for 2018. All the same, there is an engaging narrative here, insofar as it pertains to a modern adaptation of a fictional story. As a chillingly prescient attack on social media mob mentality, control on user data, and large-scale covert surveillance it reads less nuanced than it wants to be. Removed from that clunky subtext, it is a perfectly acceptable, if not rote, story. Jordan is engrossing, as he always is, but there is not much room for character depth in his journey. Montag’s entire arc hinges on a change of heart that comes too easily and has few personal stakes. Interestingly enough, there is more depth to Shannon’s viciously authoritarian antagonist. Beatty sneaks bite-sized quotables on rolling papers in his office. We see him wordlessly grapple with the knowledge gained from books that he was too tempted to avoid, knowledge he appears to hate himself for obtaining. It is commendable how the film utilizes literature to further its themes. Most notable is the allusion to Dostoevsky’s Notes from the Underground, which Montag reads in secret (it’s a bit above his reading level, given it’s the first book that he’s ever read, but I can let that go). The book presents an attack on reason, which Beatty says is the major reason for unhappiness in their society. But it also, in the manifesto-style ramblings of its narrator, presents the reader with a complex, questioning view of man’s place in the world. Most importantly, it illustrates the complexities of the human desire for free will. It is a shame that this allusion does more intellectual work than the rest of the film. There is nothing wrong with rewriting your source material to fit a modern sensibility, as long as that new take rings just as true. Fahrenheit 451 strains to tap into contemporary technophobia, but it never grounds that in the source material that it borrows from. 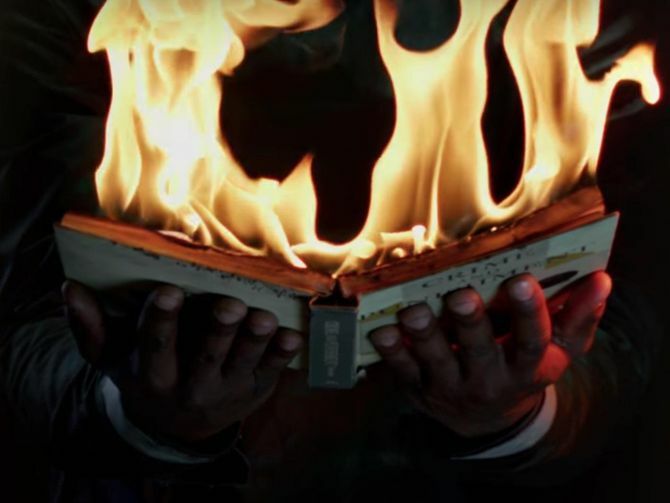 Books are being burned, but the real problem is the camera on the wall dictating people’s lives. The goal remains to spread literature back to the masses, as if that solves the problems of this dystopian world. It doesn’t. The disconnect there makes the ending ring hollow. But hey, instead of watching this movie you could go read Dostoevsky. He’s a load of fun. Or, you know, Bradbury, as his book remains relevant and engrossing.